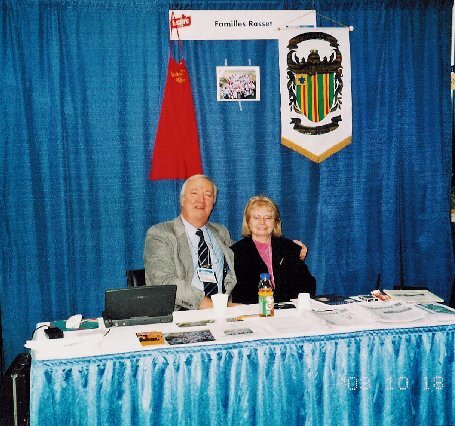 Michel J.P. Racette (Racette Family Association President). Pierre LaSalle (St-Jacques Mayor), Mario S. Racette (St-Roch-Ouest Mayor). The Racettes showed once again that they had a sweet tooth. 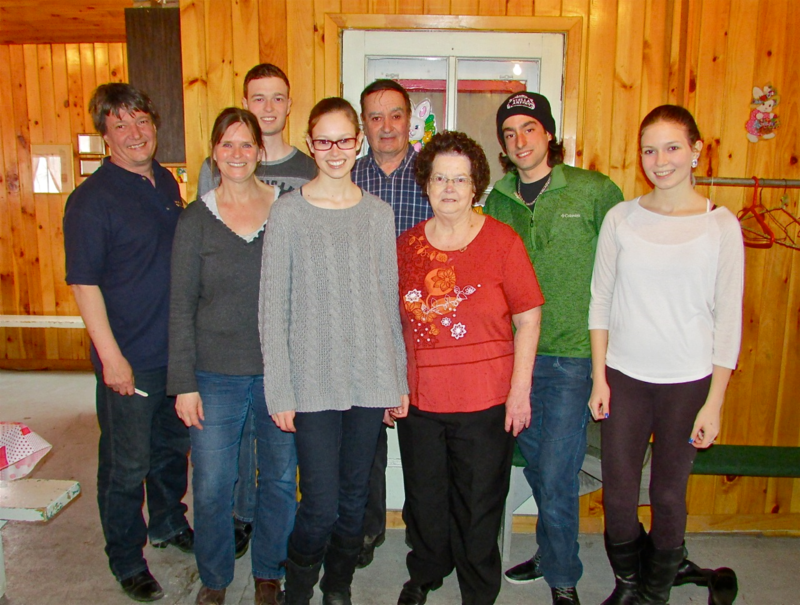 Forty of them attended the brunch organized by the Rasset Family Association on March 10, 2013, at the sugar shack Mycalin in Saint-Alexis de Montcalm. The organizers did not expect to see so many people. Fortunately there were still a few places available. It was sunny, the temperature was pleasant and the food was as usual delicious. The brunch ended outside around bins filled of snow with participants enjoying sugar taffy. 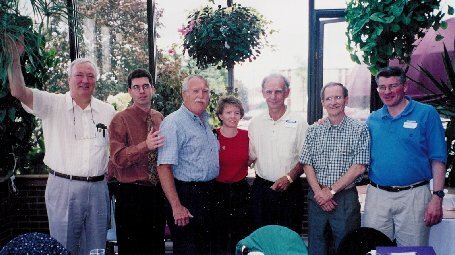 from left to right, André P. Racette (administrator), Alain Racette (administrator), Claude M. Racette (secretary-treasurer), Lise Racette (administrator), Sylvain Racette (President), François Racette (Vice-president), Jean-Guy Racette (administrator). 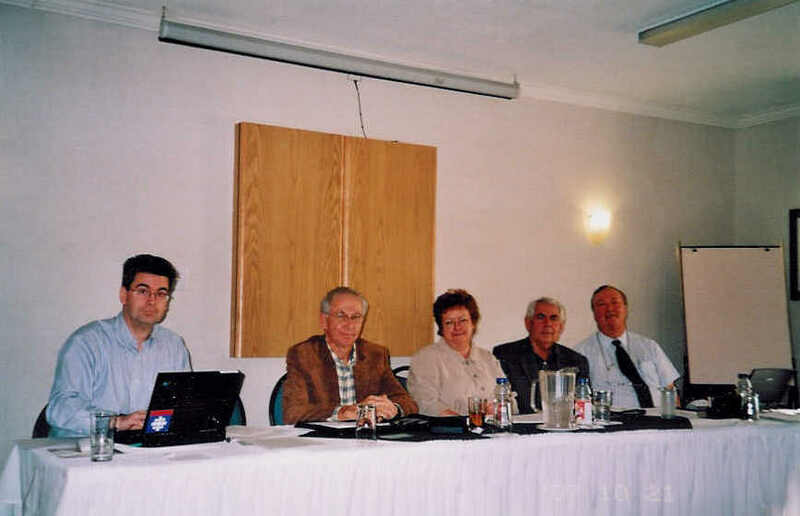 from left to right, Sylvain Racette (administrator and editor of the journal), François Racette (vice-president), Lise Racette (president), André P. Racette (administrator), Claude M. Racette (secretary-treasurer). 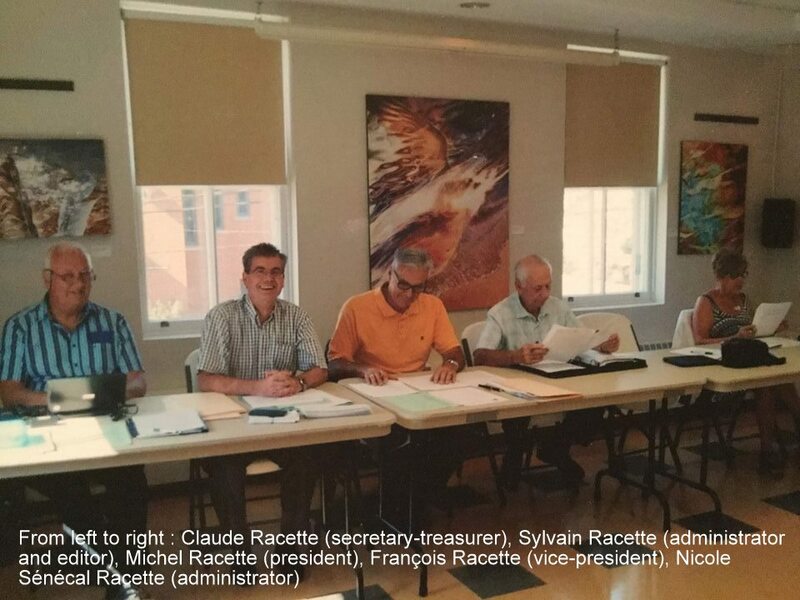 Jean-Guy Racette (administrator) and Yves Racette (administrator) are absent. 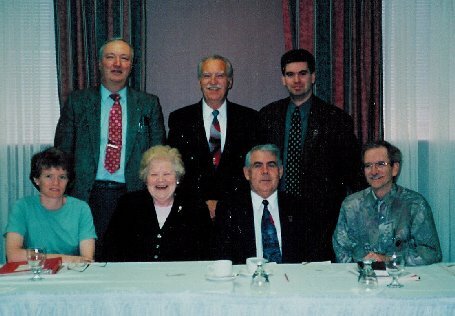 from left to right, Jean-Guy Racette (administrator), Claude M. Racette (secretary-treasurer), Lise Racette (president), François Racette (vice-president), Yves Racette (administrator), Sylvain Racette (administrator and editor of the journal), Jean-Louis Racette (administrator). 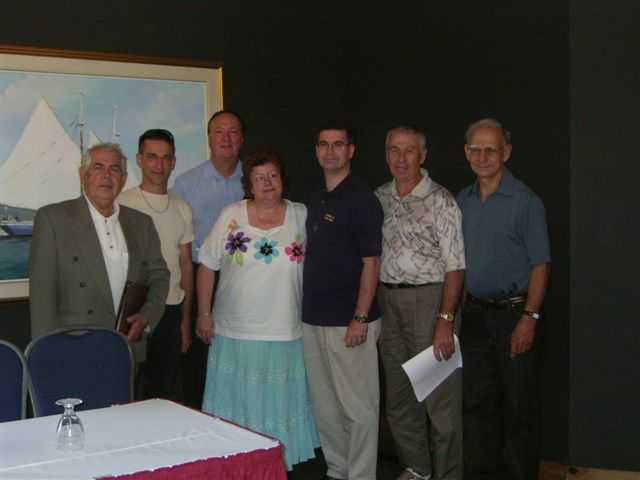 from left to right, Claude M. Racette (secretary-treasurer), Sylvain Racette (administrator and editor of the journal), Yves Racette (president), Lise Racette (vice-president), Jean-Guy Racette (administrator), Jean-Louis Racette (administrator), François Racette (administrator). 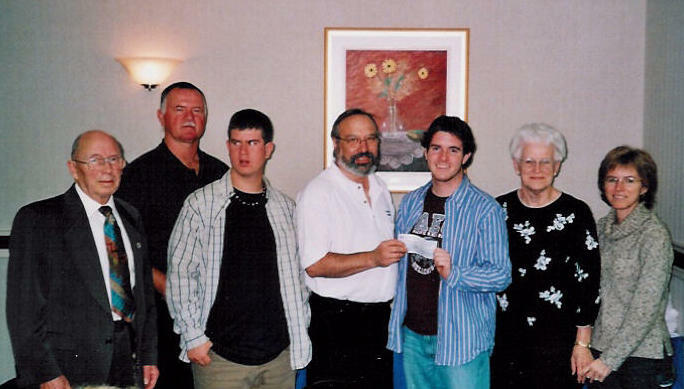 Presentation of the first Jean-Rasset prize given by Yves Racette, president, to Marc-André Bernard, grand-son of Lorraine Racette on October 23rd, 2005 at Hull. 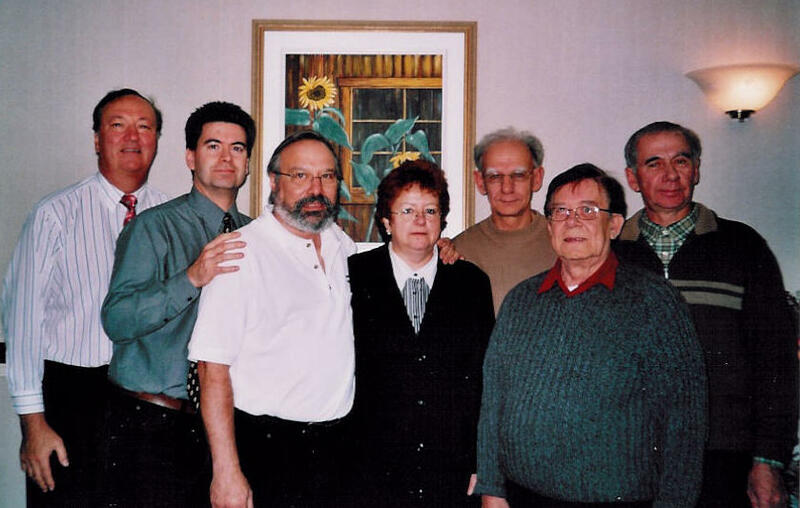 From left to right, Georges-Etienne Rochon (grand-father of Marc-André Bernard), Serge Bernard (father of Marc-André), Nicolas Bernard (the brother of Marc-André), Yves Racette (our president), Marc-André Bernard (the recipient of Jean-Rasset 2005 Prize), Lorraine Racette-Rochon (the grand-mother of Marc-André), Sylvie Rochon (the mother of Marc-André, daugther of Lorraine and Georges-Étienne). On April 13, the family gets together in the warm ambience of that Sugar Shack, followed by the all you can eat maple syrup on snow. 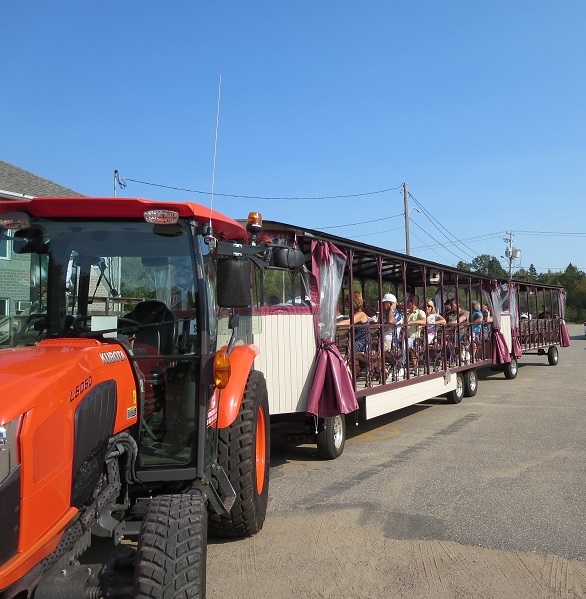 After the meal, everybody visits the animals on the premises and takes the ride on the horse drawn carriage. On September 28, 2003, at 12:30, the family enjoy a lavish brunch followed at 2 PM by the General Assembly. After the current affairs, the Assembly made a proposal to thank Sylvain Racette, the past-president, and to congratulate him on his recent marriage to Colette on September 27, 2003. There were elections for three positions on the administration board. Lorraine Racette-Rochon was elected as a new administrator and Claude was confirm as existing secretary-treasurer and Jean-Guy as existing administrator. 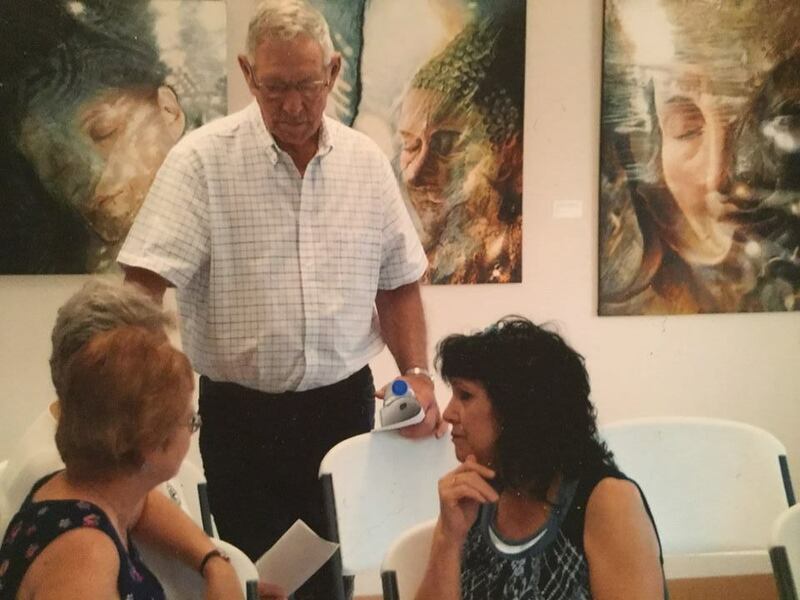 The Family Associations of the Fédération des Familles souches québécoises showed the most interest in the exhibition. Contacts were made between each other. 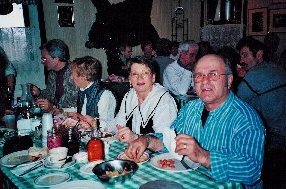 Rasset family boot with Claude M. Racette and his spouse. 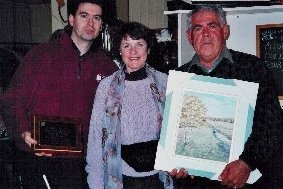 Sunday November 30, 2003, the Racette family got together in Laval to thank the previous president, Sylvain Racette for his good services. It is during this happy brunch that the Association gave him a very nice carafe. 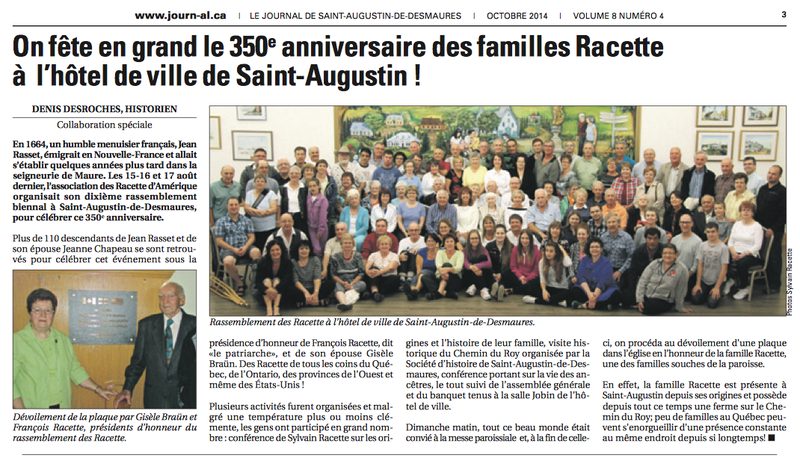 About 250 members return to their roots, ten years after the First Grand Meeting in St-Augustin-de-Desmaures. 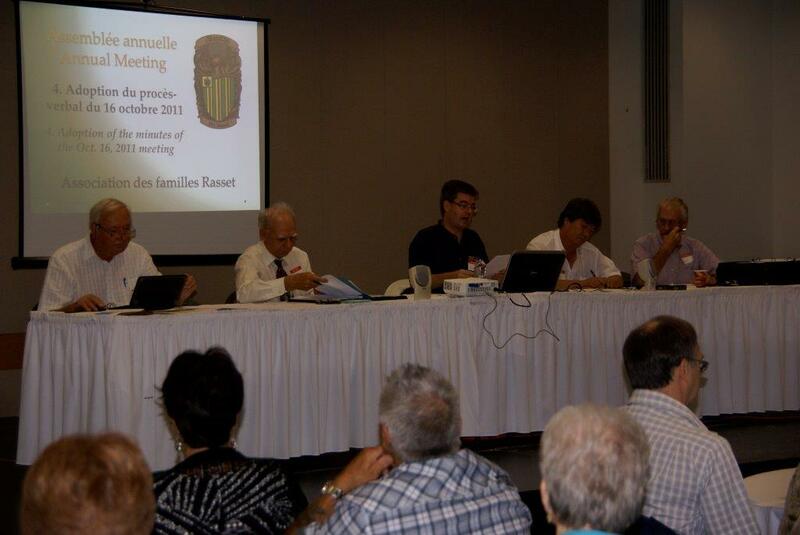 After the brunch the next day at Manoir de Neuville, the General Assembly elect a new board. 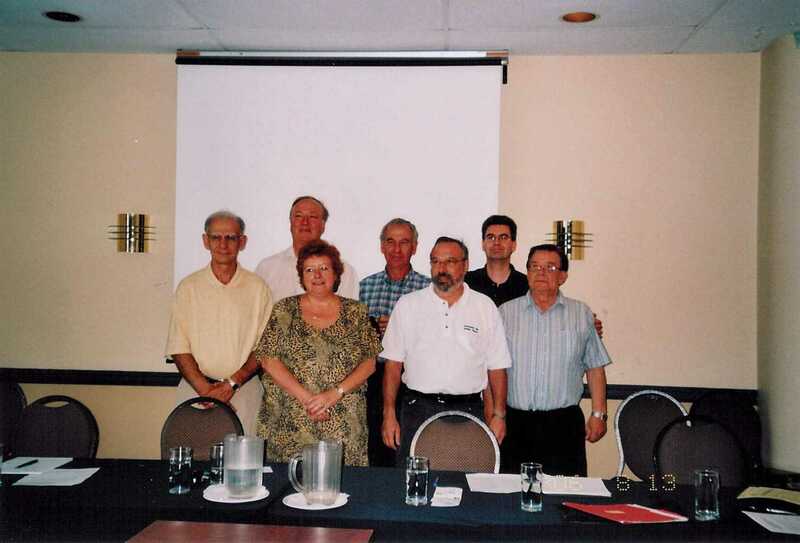 The members are André F. Racette (president), Yves Racette (vice-president), Claude M. Racette (secretary-treasurer), Louise Rochon, Jean-Guy Racette, Ronald Racette, François Racette (all administrator). 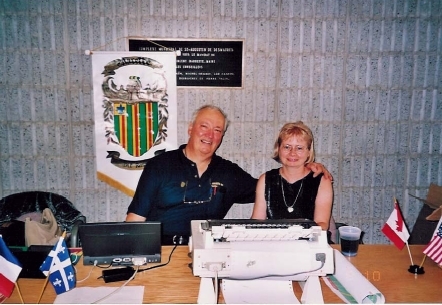 Reception of the Grand Meeting in St-Augustin-de-Desmaures from August 10 and 11, 2002 : Claude M. Racette (Secretary-treasurer) with Sherry Simard (spouse). Sugar Party at Entrelacs (Quebec) on Sunday April 8. 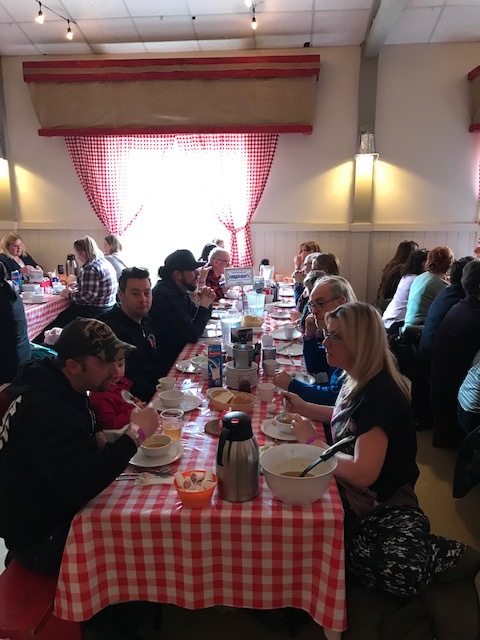 The Sugar Party at Érablière aux Deux Pierrots was so popular that the Racette members had to separate into two servings because the shack was limited to 55 persons. to André P. Racette (outgoing vice-president). On September 30th at Arundel, a brunch followed by the Annual General Meeting was attended by 35 members on this splendid autumn day. 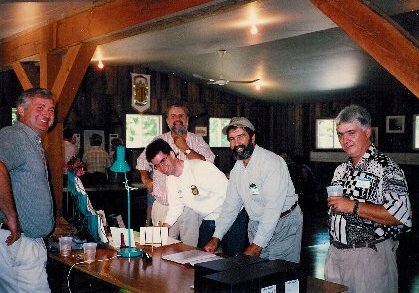 On August 19, 2000, around 150 people assist to the first meeting outside of the Province of Quebec. 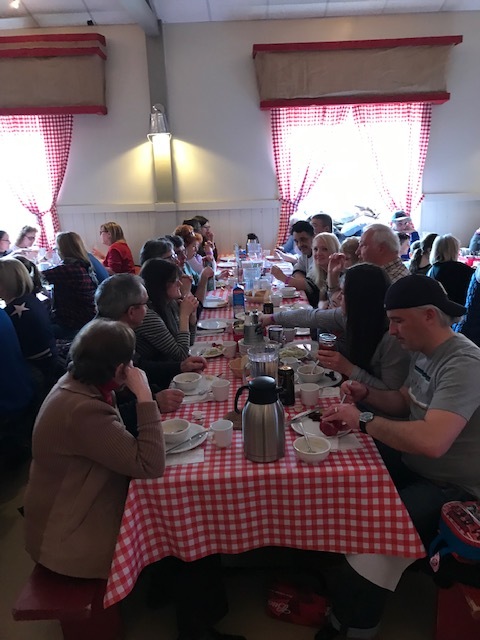 The next day, the brunch followed by the General Assembly was a real success. Concert from the American soprano Patricia Racette in the Festival of de Lanaudière. 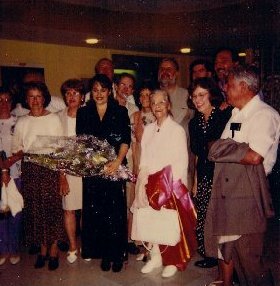 Twenty Racette members meet the artist after the show and give her flowers and a gift on behalf of the Association. 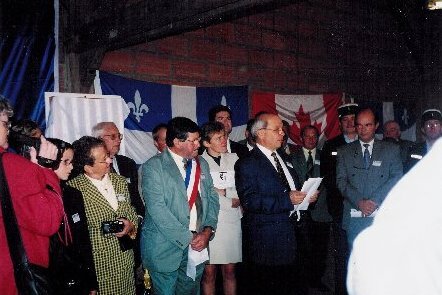 Unveiling of a commemorative bronze plate dedicated to Jean Rasset at the town hall of Ste-Geneviève with the presence of numerous personalities, followed by a supper with the Racettes from America and their cousins from France. president of the Association of Rasset in France. 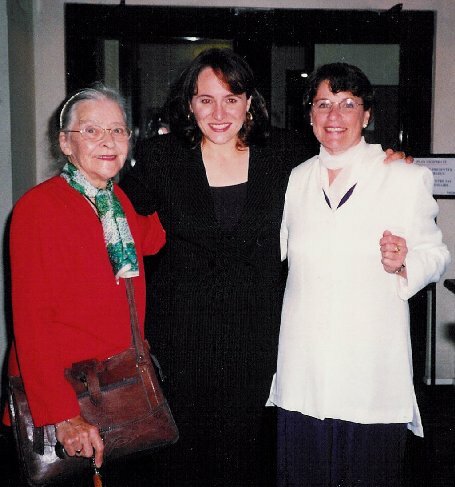 Solange Racette and Émilie Racette with opera singer Patricia Racette at the Opera de la Bastille, in Paris. More than 175 participants. 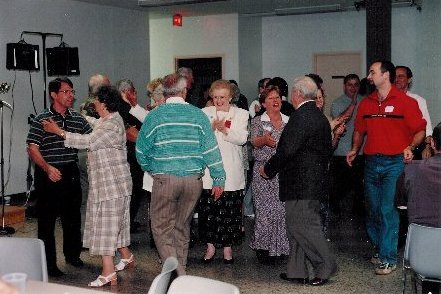 Banquet and dance. Planning of the trip to France. 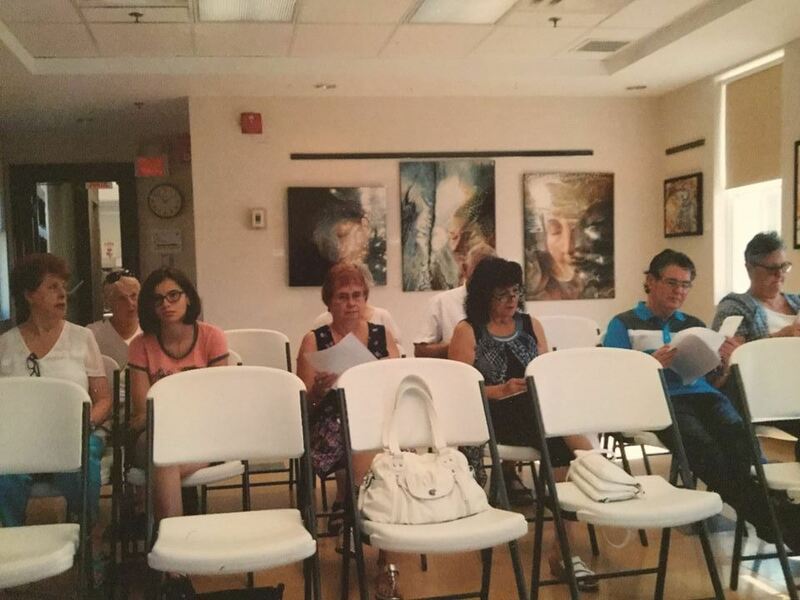 Creation of the Jean-Rasset Bursary for successful candidates in school and to encourage post-secondary studies. 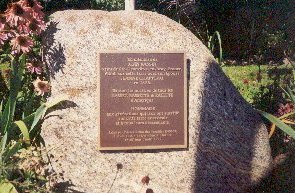 Unveiling of a bronze plate to the memory of Jean Rasset at the ancestral land with the Quebec Minister of Agriculture. The Association bulletin will now be called « Le Rasset ». faces the settlement land in Saint-Augustin-de-Desmaures. 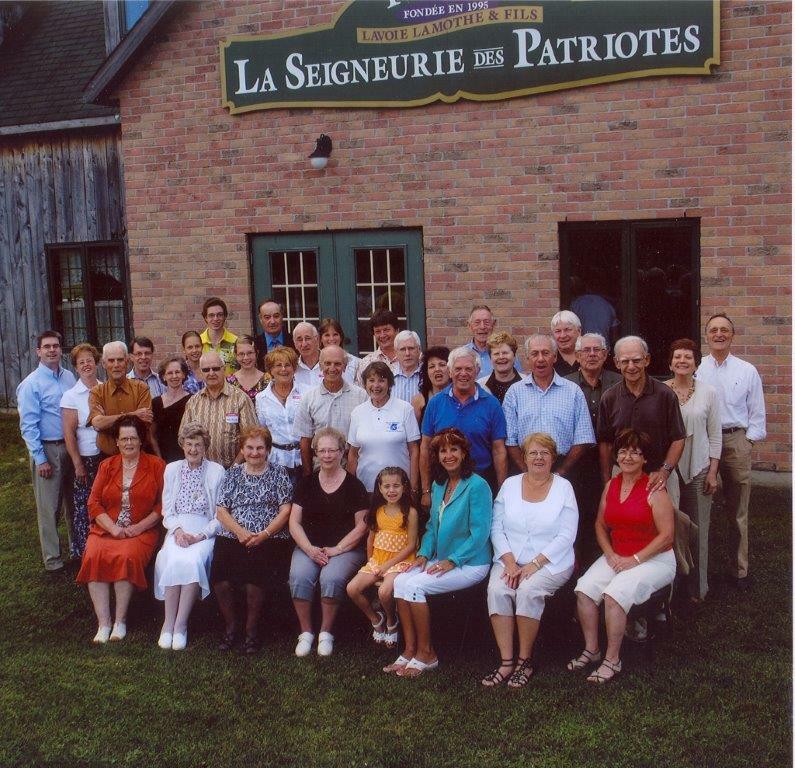 Mechoui and country celebration in the Lanaudière Region, second birthplace of many Racette families. Almost 250 participants. Publication of a study on Jean Rasset by father Gérard Lebel, C.Ss.R. in the collection « Nos Ancêtres» from the magazine Ste-Anne-de-Beaupré (vol. 28). 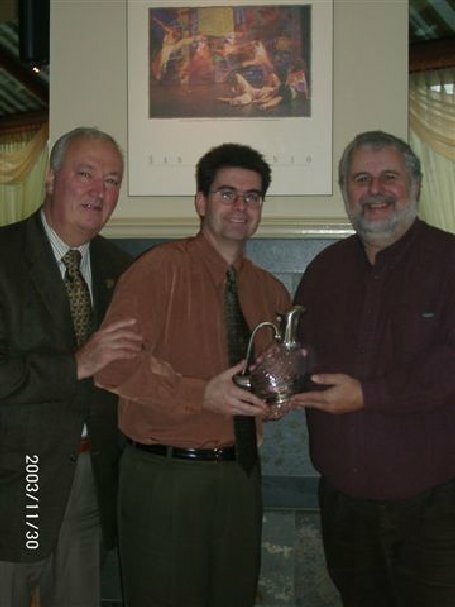 Sylvain Racette, Gilles Racette and Jacques Racette. 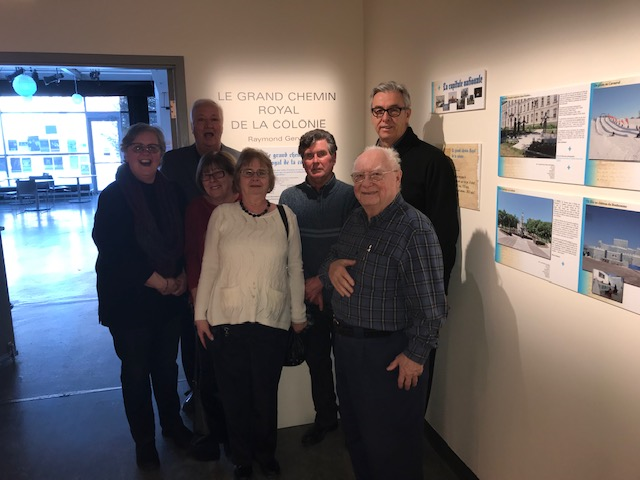 An Abitibi Theatre Company composed of Jean Rasset descendants plays an original theater piece for fifty members of the Association. 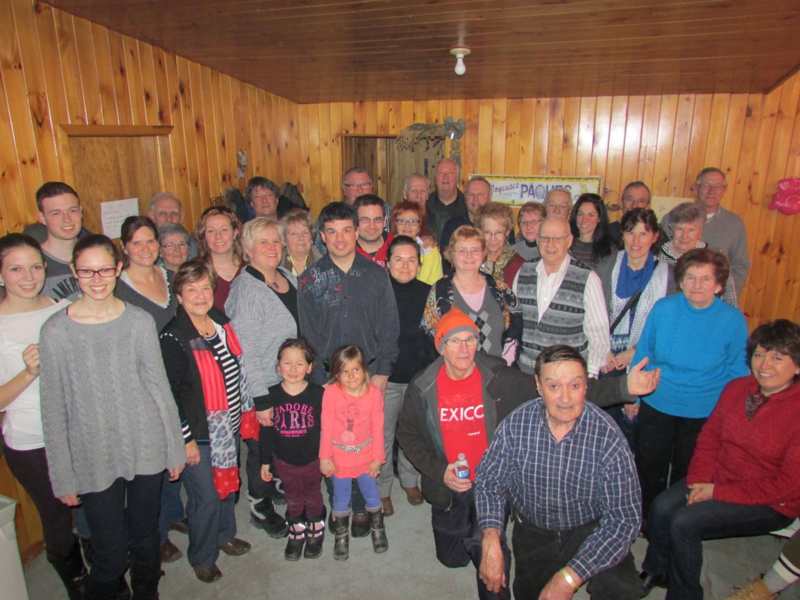 First Grand Family Reunion in St-Augustin-de-Desmaures, near Quebec. Visit of the ancestral land which is owned by descendants of Jean Rasset for ten generations. 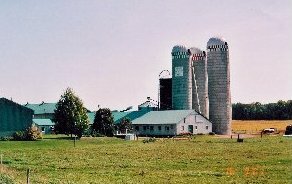 The owner, François Racette is operating a dairy farm along the St-Laurence River. 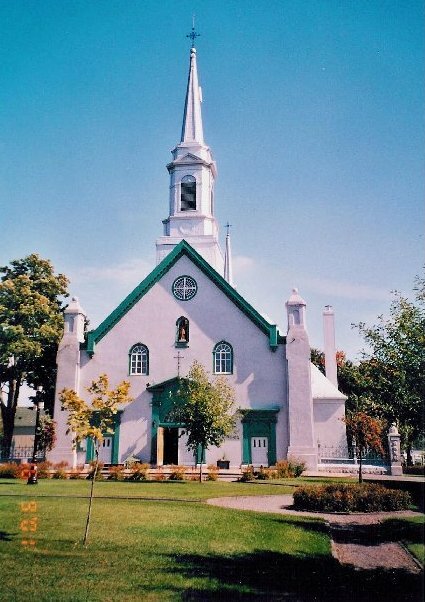 Banquet, variety show and mass at St-Augustin-de-Desmaures church. 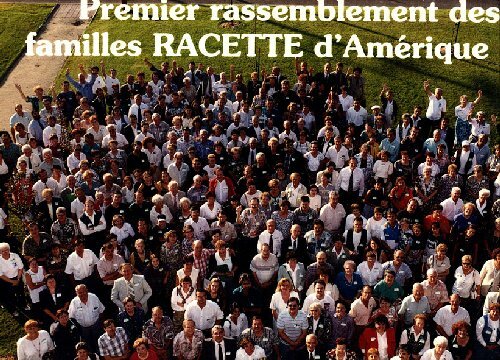 Twenty six participants approve the organization of the first grand reunion of the Racette families. Formation of several committees (Genealogy, Recruitment, etc.) Publication of the first Family Association Bulletin that will be printed every three months. 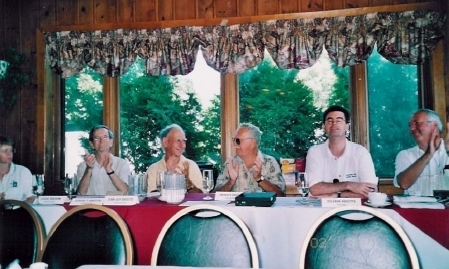 In June 17, 1992, eleven pioneers sat down to put together the Racette Family Association. 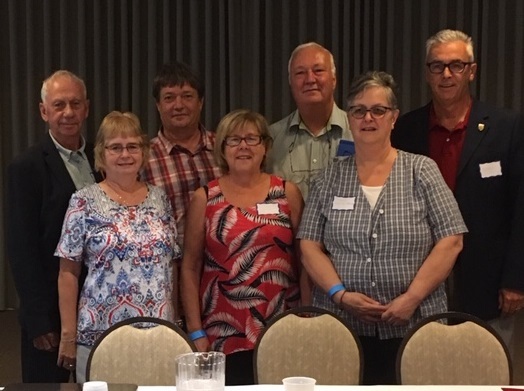 Three reunions later, fifteen of us are putting together the Rasset Family Association to regroup all the descendants of Jean Rasset in North America and promote the exchange of genealogical information within the umbrella of the Fédération des familles souches québécoises.